All of our Stationary Compactors are built from prime high quality steel plate and structural steel channel and tubing. All hydraulic and electrical components are brand name, UL® approved and of the highest quality with all moving parts having grease fittings. 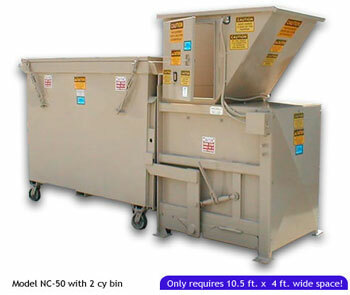 Nedland Stationary Compactors are built to provide durability and reliability with many years of maintenance free service. The Stationary Compactors are manufactured in sizes ranging from 1/2 Cu Yd to 6 Cu Yds and lengths from 44 inches to 22 feet. These compactors are backed by Nedland's more than 50 years of service, design and manufacturing experience along with a one year warranty on electrical and hydraulic components and 3 years on structure. The NC50 above is designed for chute fed applications, but can be manufactured for top, side or rear feed. Pacific Compactor Corporation, 3901 East Miraloma Avenue, Anaheim, CA 92806. Tel: 800-458-8832; Fax: 714-993-9202.